Why we should use Switch Case ? 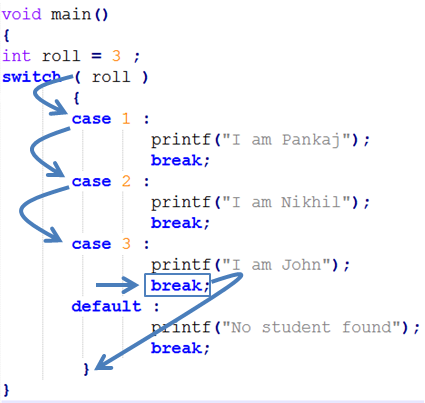 One of the classic problem encountered in nested if-else / else-if ladder is called problem of Confusion. It occurs when no matching else is available for if . As the number of alternatives increases the Complexity of program increases drastically. See how difficult is this scenario ? *Steps are Shown in Circles. Break statement takes control out of the case. 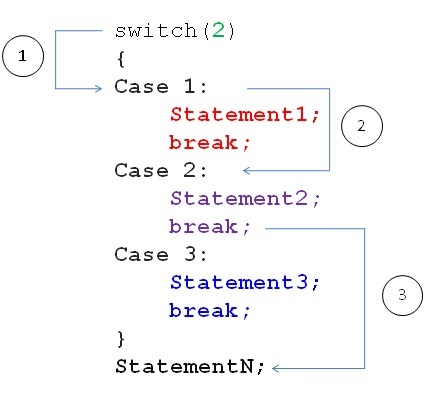 On line 5 switch case decides – “We have to execute block of code specified in 3rd case“. Switch Case executes code from top to bottom. It will validate Case number with variable Roll. If no match found then it will jump to Next Case.. When it finds matching case it will execute block of code specified in that case.